Follow these steps for the best performance. Congratulations on acquiring a set of Bones ®Bearings, known world-wide as the best brand of skateboard bearings available. All Bones® Bearings are Skate Rated™ to our precision “tolerances” to give you the absolute maximum speed and life possible, not “ABEC” rated like bearings designed to operate in motors or normal machinery. The superb quality of Bones® chromium bearing steel races with their mirror like “super finish,” removable, non-contact rubber shields, high speed, precision molded ball retainers, and Bones Speed Cream® lubricant provide unequalled roll and ease of maintenance. So, carefully install them in your wheels and you’re ready to roll. Your new Bones® Bearings are the most accurately manufactured part of your skateboard, with clearances and tolerances considerably smaller than 1/1000th of an inch. That means that a single hair is thicker than the clearance between the balls and the races inside the bearing, and a hair will clog it up and slow you down. Because you skateboard outside through dust, sand, water, mud, etc; your bearings will eventually get dirty and/or wet. When they are dirty, you will notice they don’t spin freely when you flick the wheel and you may also notice they are getting noisy. At this point you have two options: clean your bearings or replace them. WARNING! Don’t continue to use bearings that don’t spin freely on your skateboard. If you continue to ride very dirty or un-lubricated bearings, you run the risk of permanently damaging them and/or yourself. Dirt in your bearings will cause pitting of your balls and races, increase friction, cause extra heat, and can eventually cause the bearing to “freeze up” or stop rolling. If this happens to your bearings, the skateboard will stop abruptly, causing you to fall and be injured. So keep them clean, dry and lubricated with Speed Cream. Keep your bearings dirt-free, moisture free, and lubricated. Water will rust your bearings and dirt will destroy the smoothness of the super finish on your bearing races, increasing friction. Clean your bearings when they become dirty or noisy with the most environmentally friendly cleaner you can find that is suitable for dissolving oil, grease, and removing dirt from the steel, plastic and rubber surfaces. We have tried many cleaners and solvents and many of them can be used safely. Citrus based cleaners can work, but they tend to leave behind a slight residue. Solvents are dangerous to use, but often provide a superior solution to cleaning very dirty bearings. If you use a water based cleaner like a citrus cleaner or a detergent, be sure to dry your bearings IMMEDIATELY and then re-coat them with lubricant to prevent rust. Some solvents/commercial products that we have used are: pure, or almost pure, isopropyl alcohol (The kind normally found in markets is only 10% pure and does not cut grease well. ); Gumout® carburetor cleaner (found in auto parts stores); acetone (found in hardware stores). If you can’t find any of these solvents like acetone or pure alcohol, you can use paint thinner or lacquer thinner, but these cleaners are oil based and may leave an oily residue on the inner surfaces of your bearings. If you use a solvent cleaner, please wear appropriate rubber gloves and work in a safe well ventilated area. When you are finished, please remember to dispose of your solvent in a safe, ecologically sound manner. Do not add oil to dirty bearings. It will not clean the bearing, but merely flush the existing dirt further into the bearing. It may seem like they roll faster initially, but in reality you are only spreading the dirt around, and it will still be there to ruin the high precision rolling surfaces of your bearings. Clean your bearings before re-lubricating them. Gently remove the non-contact rubber shield with a push pin or the edge of a small knife by prying the shield upwards from under the shield at the inner race. It should pop up and out quite easily, so handle them gently and don’t bend them or cut the seal. If you have the labyrinth shield bearings, make sure to remove both of them. Be careful not to bend or tear the shield as you remove them. Bent shields don’t fit right and may allow contaminants into the bearing. Don’t use solvents to clean the rubber shields! Doing so may cause the rubber to blister or swell from the solvents. Just wipe the rubber shields down with warm soapy water and a lint free cloth. Make sure the shields are completely clean and dry before re-installing. Optional Cage Removal: You can clean your bearings more thoroughly by removing the ball retainer or “cage.” We only recommend this if you are using the Bones® Bearing Cleaning Unit or are an experienced bearing cleaner. To remove the ball retainer, take a straightened paper clip or similar object and place it in the spaces between the ball seats, then push the ball retainer out. Pushing alternatively in several different spots is often helpful. We recommend ONLY pushing the retainers out. If you pry them out, you will damage the ball cavities, ruining the surface of that cavity. This will, at a minimum, create more vibration and a slower bearing, and at worst, cause the entire bearing to fail. When you remove the cage, the balls can all shift over to one side and in some cases, may fall completely out of the rings. The Bones® Bearing Cleaner isolates each bearing with spacers, so there is less of a chance the balls may all come together on one side of the bearing and then fall out of the races. This is, however, somewhat common during bearing cleaning, and doesn’t mean the bearing is broken, merely 100% disassembled! 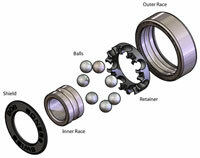 If your balls fall out of the races, you’ll need to reassemble the bearing from scratch. It’s easy, and is how the bearings were assembled in the first place, so don’t panic. You need a soft surface like a folded towel. Take the outer race and the 7 balls and place them on the towel. Make sure all the bearings are on one side like a crescent moon. Press down on the side of the outer race where all the balls are at. Angle in the inner race so the running surface of the inner race aligns with the balls and pull to the center of the outer race. It will take you a few tries more than likely, but you’ll get it. Clean your bearings and your ball retainers: If you have chosen to remove them, soak them in your cleaning solution in a polyethylene, polypropylene, or metal jar. (We don’t recommend glass, because it is easy to break, but be aware that some plastics may melt in some solvents, so be sure to use one you know is safe.) Wear suitable rubber gloves and eye protection. Gently agitate the jar making the solution flush through the bearing. Keep replacing the dirty solution with clean solution until the solution no longer changes color and you are satisfied with the smoothness of the bearing roll. If you have the Bones® Bearing Cleaning Unit, please revert to the instruction methods provided in the bottle. Reinstall your cages: If you have removed the ball retainers, use the paper clip to spread the balls out evenly and then insert the ball retainer so that each ball is over a ball seat. Then, gently snap the ball retainers back into place. Once you have all the retainers installed back into your bearings, check each bearing to be sure it spins freely. If not, repeat your cleaning cycle or replace the bearing. Lubricate your bearings: We recommend 2 drops of Bones® Speed Cream® per bearing for bearings with steel balls. For Bones® Swiss Ceramic Bearings, only one drop per bearing is needed. Do not be tempted to use your bearings without any lubricant because they “spin faster without lubricant.” Although this is partly true in a superficial way, riding your bearings without lubricant will cause them to fail quickly and may cause them to “freeze up,” which is NOT something you want to happen to you when you are skating! Reinstall your clean rubber shields: Place each one flat on the “open side” of a clean bearing where the balls are visible. Be sure the Bones® name on the shield is facing outwards, then press the rubber shields gently into place using your thumb and a rolling action. Inspect the ring around the inner race making sure there are no dimples in the rubber shield. If there are, run your thumb around it to flatten it out. If you have Bones® Labyrinth shield bearings, the shields are identical so follow this procedure for both sides of the bearing. Spin each bearing for a couple of revolutions in your fingers to distribute the lubrication throughout the inner workings of the bearing. Leave a slight coat from your fingers on the outer sides of the bearing to prevent rusting. Reinstall your bearings: When installing bearings into your wheels, be careful not to use a tool that will put direct pressure on the shield or the inner race only. Denting the shield will only cause friction and slow your bearing down. A proper bearing press or tool will only press on the outer ring of your bearing during insertion. Use a bearing press or your truck/axle to press the bearings back into your wheels. Be sure to check that your bearings are aligned properly so that your wheels spin freely, quietly, and smoothly. If they don’t, you will have to back track to seat the bearings parallel and fully into the wheel. If they still don’t spin smoothly and quietly, you will have to troubleshoot the cleaning process to find out which bearing component is incorrectly installed or worn out, and then replace that component or bearings as need be, before using the bearing in your wheel. High precision bearings like Bones® roll their best after about an hour of use in a clean environment (this initial use is called a “break in period”). If you want your bearings at their peak prior to a competition or a race, we highly recommend you break in your bearings, then clean and re-lubricate them and store in a moisture free container until you are ready to use them. When storing your bearings, be sure there is a light coat on the outer races with our Bones Speed Cream®, or a light oil to prevent them from rusting. Note: We have attempted to foresee any possible problem you may have during your cleaning process, and so these instructions may seem complex at first reading. The bearing cleaning process is logical and simple though, and you should have no problem doing this if you can understand our sequential steps. If you have any questions regarding your bearings, please feel free to contact us. Skate hard and enjoy your new Bones® Bearings!